Why has the Charity been set up? How does the Trust help? It was almost a case of Santa splash rather than Santa Dash. 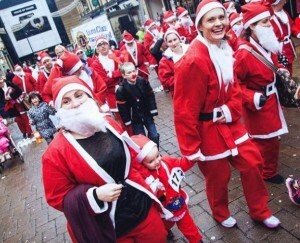 But at the last minute the rain dried up and around 200 Father Christmases set off on a one mile run – or walk – around Huddersfield town centre. The annual event, organised by Huddersfield Lions and sponsored by RRG Toyota, is in its fifth year and enables local charities to raise funds with out worrying about all the administrative costs and bureaucratic hassle. Colne Valley Conservative MP Jason McCartney and his two daughters Daisy and Eleanor were part of 21 runners who ran on behalf of the Joseph Salmon Trust which provides financial advice for parents who have lost a child. The Joseph Salmon Trust is a small charity whose aim is to offer financial assistance to people living in the Huddersfield and Mirfield areas, whose child has died.